Are you suffering from small yellow papules on the cheeks or around the eyelids? Chances are, that you are having a condition called Syringoma. Read on to know what is Syringoma as also its causes, symptoms, diagnosis and treatment. It is a form of benign (non-cancerous) tumor or adnexal neoplasm that develops in the sweat glands. The term “Syringoma” is derived from the Greek word “Syrinx”, meaning “tube” or “pipe”. The name is obviously a reference to the tubular shape of the sweat gland which is the site of growth of the tumor. The ICD 9 Code for this disorder is 216. The condition frequently arises accidentally, as a result of somatic or germline mutations, although it has also been found to be inherited as an autosomal dominant trait in some cases. Over 10 cases of Familial Syringoma among English-speaking people have been reported. The disease tends to affect adolescent and preadolescent individuals of both sexes. It mostly affects the facial region. The disease is primarily manifested by the occurrence of small, yellowish papules under the skin surface. These appear cystic or translucent in appearance and are visible to the naked eye. The lesions have a flat or round surface and have a diameter that is anywhere between 1 and 3 mm in size. In some people, the nodules occur in an eruptive form which is characterized by the emergence of multiple syringoma lesions at the same time. 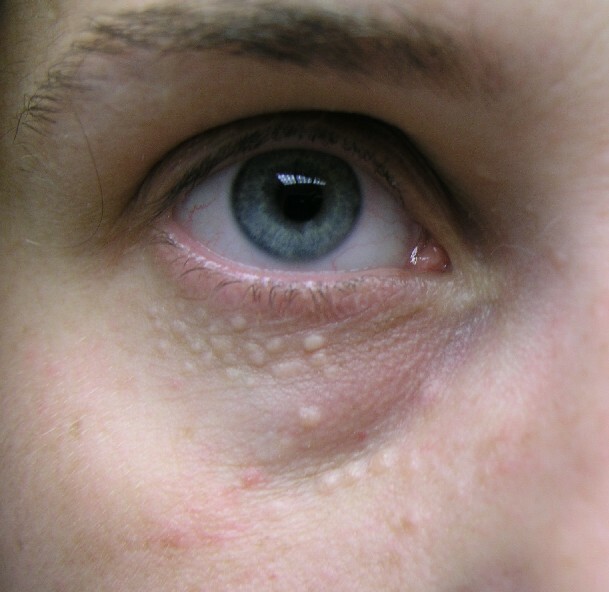 Several lesions grow together, spread across a large area across the skin surface. 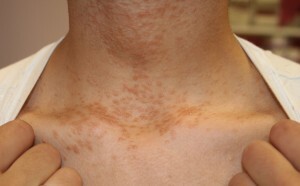 Typically, eruptive syringomas arise over the chest or penile shaft as hyperpigmented papules. These nodules are usually asymptomatic. Generally, these are non-painful and do not give rise to any other discomforts. However, picking at these growths may result in a scabbed region which can be painful and itchy. It may create difficulties for patients while applying make-up. Lesions of this type, especially the eruptive ones, may also attract unwanted attention. However, smaller nodules of this type may not be noticeable unless someone is standing too close to the patient. People who sweat a lot and have highly active sweat glands are found to suffer more from this condition. As previously mentioned, the disorder is seen to affect adolescents and preadolescents more than individuals of other age group. Sweat and hormone glands are highly active during adolescence, which is supposed to be a causative factor for this syndrome. Individuals with underlying conditions, such as Down syndrome, Marfan syndrome, Ehlers-Danlos syndrome or Diabetes mellitus are also at risk from this disorder. Around 18% patients of Down syndrome are found to suffer from Syringomas. Individuals suffering from Diabetes Mellitus are susceptible to a form of this condition called “Clear Cell Syringoma”. People of Asian or African American origins are found to be more susceptible to this disease than those of other ethnic groups. In some cases, the condition is also believed to be genetically acquired. However, not all cases of the disease are hereditary. The condition is found to have a sexual predilection as girls are likelier to have these hickeys than boys. The color of skin can also be a causative factor as individuals with a darker skin tone are found to suffer from a variant of this condition, known as Eruptive Syringoma. The diagnosis of these growths usually begins with a simple physical examination. Doctors also ask patients about the time when the lesion first occurred and whether they have experienced any painful symptoms or not. In some cases, doctors may consider taking a sample of the growth for biopsy. Biopsy of lesion helps a pathologist examine certain cells from the growth to check whether it is a Syringoma lesion or something else. Such a biopsy can be quickly performed in the office of a doctor. 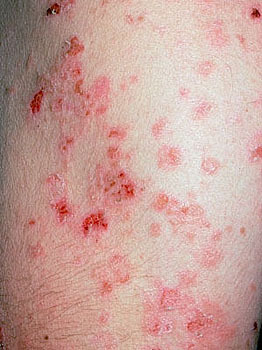 In some cases, these lesions are confused with Xanthomas, which are lumps caused by deposition of cholesterol under the skin. The treatment of these lesions become necessary only if the patient experiences any discomforts due to picking or irritating them in any way. These are usually asymptomatic in nature and cause no difficulties. Most patients like to remove these only to improve their physical appearance. The papules are also removed as part of a skin biopsy, when a doctor wants to make sure that the growths are actually benign. This involves burning off the lesion with the aid of heat. Lidocaine is injected over the growths to minimize pain. Electrocautery needles are then introduced into the benign tumors to burn them from the inside. Small scabs form over the region in five to seven days and heal rather quickly. It involves use of extremely low temperatures to freeze the growths and make them fall off. Generally, liquid nitrogen or any other chemical having sub-zero temperature is used for this purpose. In this method, the abnormal growth is completely cut out (excised) with scalpel, scissors or a flexible razor blade. The technique uses pulsed dyed laser, in conjunction with carbon dioxide, to remove the hickeys. This is an advanced and costly process and not within the means of every patient. In some cases, the growths may also be removed with erbium lasers. It is a minimally invasive technique that requires use of a local anesthetic. This is a surgical technique that rubs off the nodules by abrading the skin surface with wire brushes or fine sandpaper. Cut a potato or cucumber into half. Rub one halved slice of the vegetable for 5-10 minutes over the affected skin area. This will let the juice flow over the lesions from the section. Wash the area after 15-20 minutes. Doing this twice every day can make you see results after a week. Rub the hickeys with fresh juice of lemon or Apple cider vinegar. For added effect, you may also mix lemon juice with a little glycerin. This can help lighten any post-surgical scar marks and make them fade away much faster. Gently massage the affected spots of skin with almond oil. Almond oil is extremely nourishing and supplies the skin with important nutrients. This helps abnormal growths over the skin fade away faster. Regularly washing the skin with Aloe vera gel can be highly beneficial for its health. Aloe vera can help in quick removal of scars that may appear after a surgical removal of the hickeys. Make a mixture of sandalwood, rose water and milk cream. Apply this paste over the skin blemishes. This mixture helps lighten the skin tone and promotes faster disappearance of post-operative scar marks. These are benign neoplasms and do not lead to any serious complications, unless some underlying cancerous condition is present. The complications of Syringomas are primarily of cosmetic significance. In some cases, surgical removal of these growths may leave scars. There is also a possibility that the lesions might recur. Due to these reasons, it is recommended that patients should consult dermatologists about the treatment option that they should go for and the risks and side effects involved with each procedure. Patients often require multiple visits to the dermatologist to prevent flare-ups of the growths. When treated well, these nodules are completely destroyed and cause little or no scarring. Possibility of recurrence is also remote in such cases. Individuals who are prone to this problem should try to avoid stress and anxiety. Excessive mental stress can act as a trigger factor for this disease and worsen its symptoms. Regularly visiting a dermatologist can also enrich patients with useful knowledge about caring for their skin. In obese people suffering from this disease, daily workouts can help shed excess body weight and improve metabolism. This can contribute to the health of skin and help prevent development of Syringoma growths. These are multiple Syringoma lesions that develop together at the same time. These are generally found to develop in the armpit and over the chest and abdomen. It is a rare form of Syringoma and is viewed as an Eccrine sweat gland tumor. ES lesions are small, flesh-colored and generally develop over the anterior body surfaces of females. These usually arise during or before puberty. 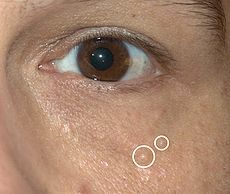 This variant of Syringoma has a high prevalence among Asians and African Americans. This is generally held as an asymptomatic condition although some patients complain of mild itchiness. These nodules usually resolve naturally and do not need any medical treatment. They remain stable in most cases and cause no long term complications. However, patients may experience some aesthetic discomforts if the papules arise on the face or any other exposed region of their body. Treatment of this condition aims at removing the growth, minimizing scarring and preventing the recurrence of the growths. Medications are not considered to be effective for this problem. Topical Adapalene and Tretinoin as well as Oral Isotretinoin have been used for curing the condition, without much success. Invasive techniques, such as Cauterization, Cryotherapy and Dermabrasion are usually considered to be effective for removing these benign tumors. 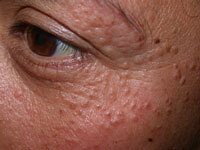 View these Syringoma photos and learn more about this skin problem. These carefully chosen Syringoma images will give you an exact idea of how the hickeys developing from this disorder look like. If you are suffering from Syringoma growths on your body, immediately get in touch with a good dermatologist. With proper diagnosis and effective treatment, the abnormal lumps can go away much faster. Even if a cancerous growth is diagnosed, quick diagnosis can ensure its faster removal and help you avoid any potential life-threatening complications.